The Blessing, the latest from the Emmy Award-winning team of Hunter Robert Baker and Jordan Fein, is the story of a Navajo coal miner and single dad as well as his teenage daughter, who navigate life on their reservation in northern Arizona. Other than Erick Stoll and Chase Whiteside’s stealthy stunner América, I can’t think of another documentary I’ve seen this year in which the simplest of premises yields such an emotional powder keg. 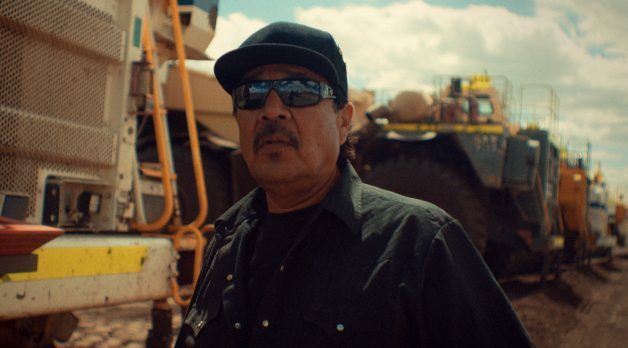 The film’s a nearly Shakespearean drama, one in which a deeply religious father is forced to choose between sacrilege (taking part in the destruction of his sacred tribal mountain) and feeding his kid (as coal mining is the sole industry on the rez). Meanwhile his daughter is forced to choose between saving her mentally and physically exhausted dad from any further stress and being true to herself (she has a passion for playing football, not running cross country like her siblings). Filmmaker caught up with the acutely attuned co-directors to learn more about their riveting film prior to The Blessing’s November 9th premiere at DOC NYC. Filmmaker: How did you meet Lawrence and his daughter Caitlin, and what made you think they’d make such fascinating characters for a film? Baker and Fein: Five years ago we crossed paths with Lawrence on the production of a narrative film captured on the Navajo Nation. He’s a tall charismatic man with tremendous radiating presence. We forged an immediate bond predicated on the idea that he had a profound story that he wanted to tell. Neither of us knew what the film would become – or that year after year we’d turn back to a hand-drawn map to navigate red earthen roads to the remote part of the United States that Lawrence and his family call home.